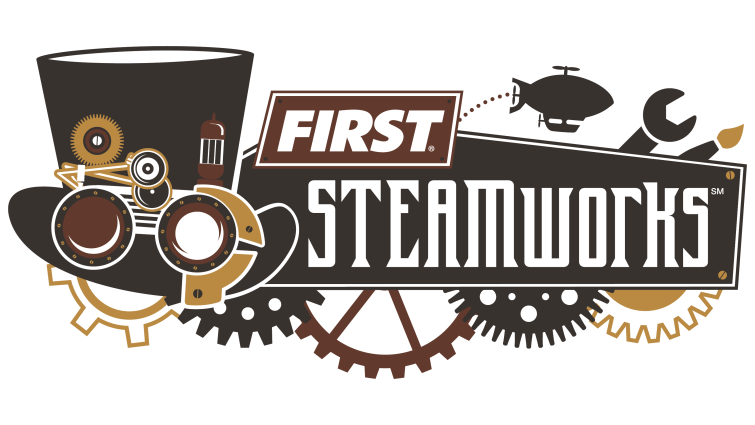 FIRST Steamworks features a historical but enchanting steampunk theme. Two alliances of three robots collect fuel to build steam pressure, install gears to engage rotors, and climb aboard for lift off for a long airship race. The alliance who is best prepared for the flight wins. There are three main ways to score match points: Build Steam Pressure, Start Rotors, and Prepare for Flight. Each alliance holds an airship with two pilots on board, a boiler to build steam pressure, and a loading lane in which players load fuel and gears onto their robots. Alliances build steam pressure by collecting fuel in the form of balls and successfully scoring it in their boiler (high goal scores more points than low goal). The rotors have to be collected and delivered to the pilots by robots for installation. When the timer gets to the last 30 seconds of the match, the robots must climb their ropes to ascend their airship before time runs out. Each match starts with a 15 second autonomous period in which robots operate independently of human control. During this period, robots attempt to deliver gears, score balls, and/or cross into neutral territory for match points. Afterwards starts the 2 minute and 15 seconds long gameplay in which the alliances work together to score as many match points as possible before the timer runs out.